Judged by the standard Morton so eloquently set, writing on the north by the historical profession in the past fifteen years has been far from impressive. Few scholars have turned their attention northward and, although the number has increased of late, their efforts have gone largely unnoticed by the larger profession. With the exception of the impressive literature compiled by fur trade historians on the period before 1900, northern historiography remains outside the mainstream of contemporary scholarship. The north is treated as a region on and of its own, a quixotic appendage to the nation-state, noted for its tales of adventure, courage and fortitude, but seen as largely irrelevant to issues of larger national concern. Standing apart from this general trend is the rapidly expanding literature on the northern fur trade. According to several definitions of what constitutes the north, areas characterized by an active fur trade (and limited settlement) are, with few exceptions, northern. As a result, there are both temptation and rationale for incorporating all fur trade literature within the broader northern historiography. To do so would be inappropriate, for the notable rise in fur trade history is more clearly tied to a surge in western Canadian historiography and more properly belongs within that region’s historical tradition. Fortunately, however, historians have followed the fur trade north, providing useful analyses of economic and social patterns in the nineteenth century, and leading the way in the study of the evolution of Native-white relations in the north. Anthropologists have long dominated the study of northern Indians and the fur trade. The voluminous contribution of anthropologists to our knowledge of northern districts is ably summarized in June Helm, ed., Handbook of North American Indians, vol. VI, Subarctic (Washington, 1981). Though historians have expressed some reservations with the limited historical component in the various chapters and a debatable periodization of the contact eras (fur trade stable to 1950, government intervention thereafter), the volume provides non-specialists with a welcome introduction to an otherwise unwieldy body of literature. Historians, historical geographers and ethnohistorians have added their ideas and methodologies to the anthropological studies of northern Natives and the fur trade. A. J. Ray, Charles Bishop, and Shepherd Krech III are the leading contributors to this field. Professor Ray has led the general expansion in fur trade scholarship, his Indians in the Fur Trade (Toronto, 1974), and Give Us Good Measure (with D. Freeman, Toronto, 1978), standing as landmarks in the field. In a provocative article with Charles Bishop, Ray challenges the anthropologists’ chronology for sub-arctic development and argues for a more evolutionary pattern of contact relations. Charles Bishop’s major contribution, The Northern Ojibway and the Fur Trade (Toronto, 1974), is an excellent example of the value of ethnohistorical inquiry. Combining interviewing techniques with archival research, Bishop develops a challenging portrait of the patterns of change in one Native group within the context of the fur trade. The third individual, Shepherd Krech III, also an ethnohistorian, has focussed on the Kutchin Indians of the lower Mackenzie River and northern Yukon. To date, Krech’s contribution consists of a series of articles on such topics as Native response to disease, population decline attending fur trade expansion, and Kutchin economic involvement in the fur trade. These three scholars have worked closely together in developing their interpretations of northern history. The fruits of that cooperation are clearly evident in The Subarctic Fur Trade: Native Economic and Social Adaptations (Vancouver, 1984). Originally presented as conference proceedings on the northern fur trade, the essays reveal much about the impact of European expansion. Particularly interesting is A. J. Ray’s paper on Native welfare in which he challenges the standard assumptions that “Native welfare societies” developed in the post-World War II period. Drawing on his extensive knowledge of Hudson’s Bay Company practices, Ray argues that such dependency developed much earlier as an adjunct of the fur trade. Together, this collection stands as a fitting indication of the current high standards of northern fur trade historiography. Ray, Bishop and Krech do not, of course, have the field to themselves. Toby Morantz, who contributed an essay to the Krech collection, has written, with D. Francis, an extensive study of the fur trade on the east coast of James Bay. Partners in Furs: A History of the Fur Trade in Eastern James Bay, 1600-1870 (Kingston, 1983) does not so much provide new interpretations as apply the arguments of recent fur trade historiography to an often neglected region. Similarly, William Sloan on the Athabasca country,  Colin Yerbury on the Nahanni district  and Ken Coates on the Yukon River basin,  have analyzed the dynamics of nineteenth century fur trade relations in specific northern settings. This work, which is far from complete, has encouraged the integration of northern districts into general fur trade studies, demonstrating how Native assertiveness, decimation by disease and other fur trade influences characterized the northern as well as the southern fur trade. Perhaps more importantly, the fur trade historiography illustrates that northern writing need not be intellectually distinct from southern work. The fur trade literature, so strong for the nineteenth century, virtually ignores the twentieth century trade. With the exception of Charles Bishop’s work on the northern Ojibway, several preliminary studies by Peter Usher  and Hugh Brody’s forcefully argued analysis of contemporary situations in north-eastern British Columbia,  historical work remains sparse. To date, the study of more recent economic adaptations remains the purview of anthropologists, who build their analysis more on oral history than on written documents. Much can be learned from such studies. Michael Asch’s observations on the twentieth century trade  and the material assembled in Helm’s Handbook provide challenging interpretations of the evolution of this sector of the northern economy. The strength of the nineteenth century fur trade historiography, particularly the literature’s ability to speak to a broader historical constituency and its position at the forefront of interpretive innovation, only highlights the limitations of remaining scholarship on the Canadian North. One useful test of the success of regional scholarship is the extent to which national surveys address specific regional concerns. While this has occurred with the fur trade studies, it has not as yet with northern historiography in general. Recently published surveys reveal that historians of the post-Confederation years have found little room for northern themes. R. C. Brown and R. Cook’s well-regarded Canada 1896-1921: A Nation Transformed (Toronto, 1974) does not deal with the Klondike gold rush and related events, even though these received broad popular and political attention in their time. Similarly, Marr and Paterson’s Canada: An Economic History (Toronto, 1980) offers but one sentence on that most important episode, and otherwise ignores northern economic issues. In direct contrast is Tom Naylor’s controversial The History of Canadian Business, 1867-1914 (2 vols. Toronto, 1975), in which frequent reference is made to the impact of the gold rush on contemporary business. Other text-book surveys, such as Sprague and Finlay’s The Structure of Canadian History (Toronto, 1983), Granatstein et al., Twentieth Century Canada (Toronto, 1983), and Bothwell, Drummond and English, Canada Since 1945: Power, Politics, and Provincialism (Toronto, 1981), have few words to offer on northern topics. A textbook prepared by a group of historical geographers runs counter to this trend. Heartland and Hinterland contains a full chapter on the north. Although Peter Usher’s contribution is weighted heavily toward contemporary issues, its inclusion marks this volume off from others. The failure to include the north more fully in broad surveys indicates the continuing southern focus of the profession, and the inability of northern specialists to develop a broader audience for their work. The neglect of the north reflects, at least in part, the very small number of professional historians interested in the region. While regional studies elsewhere have attracted large numbers of energetic, talented and committed historians, northern Canadian studies are supported only by the diligent efforts of a few scholars. The absence of a northern university, and, until recently, adequate regional research facilities have severely hampered efforts to expand the profession. Northern specialists are scattered across the country, held together in a most tenuous fashion by the Northern History Group of the Canadian Historical Association and the personal contacts of Morris Zaslow, Bruce Hodgins and a few others. Sparsely attended sessions at annual C.H.A. gatherings have not proved sufficient to encourage additional research, nor have they provided an adequate forum for northern scholars to explain their region to other Canadian historians. Far more successful in this regard have been special topic conferences. The Arctic Islands Conference in 1981 and the Alaska Highway Conference held two years later brought northern specialists of various disciplines together to share their research. The first conference is ably preserved in A Century of Canada’s Arctic Islands (Ottawa, 1981), edited by Morris Zaslow; papers selected from the proceedings of the Alaska Highway 40th Anniversary Conference appear in The Alaska Highway, edited by K. S. Coates (Vancouver, 1985). It is hoped that there will be more conferences of this sort in future years. Partly because of the limited number of northern historians and the virtual absence of indigenous scholarship, the writing of northern history lags far behind regional and thematic studies elsewhere in Canada. Methodologies and questions of interest elsewhere in the country are seldom applied in northern settings. Instead, with the exception of fur trade studies, the majority of the writing continues in a narrative vein. Fascination with the real-life melodramas played out on the frozen wastes of the final frontier continues to generate a seemingly endless array of popular history pieces designed to satisfy an inexhaustible demand for northern ephemera. Diaries of northern explorers, Klondike adventurers and modern day frontiersmen roll off the presses, tapping the extensive market for thrilling tales from the high latitudes. The material understandably seldom addresses questions of professional concern; its sheer bulk, as yet not made meaningful by extensive academic work, reinforces the image of northern historical scholarship as antiquarian and largely irrelevant. Morris Zaslow, easily the dominant force in northern historiography, epitomizes this tradition, and indeed was instrumental in establishing it. In his valuable survey, The Opening of the Canadian North, 1870-1914 (Toronto, 1971)  and the richly detailed Reading the Rocks: The Story of the Geological Survey of Canada, 1842-1972 (Ottawa, 1975), the concerns and contributions of what might be called the “Zaslow school” are clearly delineated. The emphasis is on the process of opening the north, and therefore on the agents of southern expansion. Explorers, missionaries and government officials receive primary attention as the harbingers of a new, southern way of life. 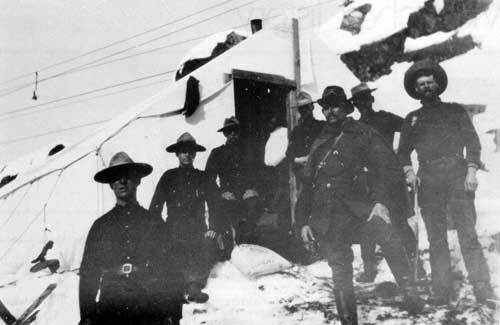 With attention focussed on the activities of “outsiders” such as members of the Geological Survey of Canada, Vilhjalmur Stefansson and North West Mounted Policemen, insufficient consideration is given to the social and economic structures that developed as a result of and alongside that expansion. Professor Zaslow has shaped the field both by his writing and his supervision of graduate students. R. J. Diubaldo’s impressive study of Stefansson, prepared under Zaslow’s direction and published as Stefansson and the Canadian Arctic (Montreal, 1978), reflects the school’s emphasis on outsiders. Probably the best recent historical work on the north, Diubaldo’s study offers a carefully balanced analysis of the character and activities of this most controversial Arctic adventurer. Nevertheless, as Diubaldo points out, Stefansson earned the enmity of most non-native northerners, enjoyed few successes in his efforts to popularize his painfully naive notions of the “friendly Arctic,” and was largely unable to convince the government of Canada to adopt his vision of the north. Another of Zaslow’s students, W. R. Morrison, has written on the extension of Canada’s reach northward, on how this country established sovereignty over the lands it claimed. “The Mounted Police and Canadian Sovereignty in the Western Arctic,” a paper published in the Occasional Papers of the Prince of Wales Northern Heritage Centre (Yellowknife, 1985), again reflects this school’s emphasis on the south-centered view of northern history. The work of Zaslow and the other members of this school  most of which unfortunately remains unpublished, in thesis form  has greatly broadened our understanding of the north. It is, however, only the beginning of a truly regional history. The contribution of this “school” emerges particularly in the analysis and description of government policy. Morris Zaslow’s handsomely produced Reading the Rocks is a competent narrative account of the activities of the Geological Survey of Canada, the government agency responsible for much exploration, mapping and geological surveying through the north. His 1984 contribution to the Canadian Historical Association pamphlet series, The Northwest Territories 1905-1980, emphasizes the influence of the federal government on the modern history of the Territories. In a similar vein, The Boundary Hunters (Vancouver, 1982), by Lewis Green, recounts the activities of Canadian and American surveyors defining the border between Canada and Alaska. W. R. Morrison’s studies of the Mounted Police have charted the role of the force in extending government control over the dispersed population of the north. There have also been a number of more interpretive works on specific aspects of federal policy. R. Diubaldo has produced several such studies. “The Absurd Little Mouse” assesses government regulations concerning the Inuit, focussing on a 1939 decision to define the “Eskimos” as Indians. His other essays include a study of Canadian and American negotiations over the Canol Pipeline and the Alaska Highway during World War II, a more general survey of defence policy for the Arctic Islands, and a government report on the role of the north in continental defence. Sheila Grant’s examination of the “Northern Nationalists,” a loosely formed group that later coalesced as the Arctic Institute, highlights the importance of key individuals in developing northern policy. Pat Kyba’s “The Northern Vision” provides a much-needed study of the proposals of John Diefenbaker’s Conservative government, 1957-1963, illustrating that there was perhaps more substance to the “vision” than most commentators have assumed. This material on government policy is highly informative and speaks to issues of great concern for students of northern development. It is, like the work of the Zaslow school, northern history from a southern perspective, concentrating chiefly on the origins of federal programmes. Given federal constitutional preeminence in the north, however, such studies do provide essential foundations for regionally-based research. The search for more detailed studies on the region leads to consideration of an often ignored body of literaturethat prepared by professional historians under the auspices of the federal government. Parks Canada and, more recently, the Treaties and Historic Research Centre of Indian and Northern Affairs Canada (THRC) have sponsored numerous research projects on northern themes. Prepared primarily as internal documents, they respond, logically enough, to departmental concerns. Contracted work for the THRC, for example, consists mainly ofsummary pieces based on secondary material and some archival research. They can, like W. R. Morrison’s A Survey of the History and Claims of the Native Peoples of Northern Canada (Ottawa, 1983) and Under the Flag: Canadian Sovereignty and the Native People in Northern Canada (Ottawa, 1984),  provide useful introductions to themes of current government interest. To its credit, the THRC, which has recently contracted for additional studies on Inuit-government relations and northern treaties, provides a wide (and free) circulation for its research reports. Though the researchers correctly apply their talents to Parks Canada’s specific departmental goals, they have compiled a number of studies which other regional historiansparticularly those interested in the Yukonshould find useful. Efforts to mine these reports are, however, likely to be impeded by Parks Canada’s restrictive circulation policies. Classified as internal working documents, they are not widely available unless released in the department’s spartan publication series History and Archaeology, the lavishly produced Canadian Historic Sites: Occasional Papers in Archaeology and History, or the more widely distributed Research Bulletins. Copies of the unpublished reports are held in the regional offices of Parks Canada, the National Library and several archival institutions. While most of the reports are in manuscript form, several major works, including Guest’s survey history of Dawson and a history of northern mining technology, are available only on microfiche. In this format, few will have the opportunity, and fewer still the determination, to examine this potentially useful material. With regret, one must accept the fact that departmental priorities dictate both the scope and the format of these research reports. Fortunately, much of the recent writing is more accessible than the government reports. Several themes predominate, beyond the previously discussed pre-1900 fur trade and federal northern policy. Among these, exploration and the Klondike gold rush are, not surprisingly, prominent, and a number of scholars have broken off from the Zaslow school to offer regional perspectives on government policies and programmes for the north and on specific aspects of the society of the Canadian north. The material both illustrates the need, and lays the groundwork, for a more extensive regional history. The supply and, one assumes, the demand for writing on northern and Arctic exploration seem unlimited. Recent years have seen numerous reprints of explorers’ journals and dozens of articles and monographs on famous and not-so-famous northern adventurers. The best place to approach this literature is through the encyclopedic The Exploration of Northern Canada, 500 to 1920: A Chronology (Toronto, 1978), by Alan Cooke and Clive Holland. This impressive research aid consists of a short descriptive entry for each known exploratory trip in the (broadly defined) Canadian north before 1920, with ample references to primary and secondary sources for those interested in pursuing individual cases further. The lives of many of the key explorers can be examined in greater detail in the published volumes of the Dictionary of Canadian Biography. There are several more general studies available to supplement this material. The Yukon is particularly well-served in this regard. A. A. Wright’s Prelude to Bonanza (Sidney, B.C., 1976), provides an adequate, though not interpretive, summary of pre-gold rush activities in the Yukon River basin. The book was based on published primary sources and left a great deal of material uncovered. That gap was closed in part with the publication of Fur Trade and Exploration: Opening the Far Northwest, 1821-1852 (Vancouver, 1983), by T. Karamaski. Though the volume contains little new information, it is solidly based on Hudson’s Bay Company records and provides an adept survey of fur trade explorations in the region. Despite an impressive number of volumes tracing individual reconnaissances and the many reproductions of travellers’ journals, there has been little analytical work on northern exploration. The major exception, in addition to Diubaldo’s study of Stefansson, is Hugh Wallace’s The Navy, the Company and Richard King (Montreal, 1980). Professor Wallace provides a carefully crafted analysis of the principles and personalities of the Arctic exploration corps in the mid-nineteenth century, focussing on the generally rejected but, the author contends, unfortunately misunderstood ideas of the iconoclastic Dr. Richard King. The Navy, the Company, and Richard King makes a welcome departure from the all-too-frequent narrative descriptions of northern exploration, revealing, as does Wallace’s contribution to A Century of Canada’s Arctic Islands,  that more interpretive approaches significantly aid our understanding of northern discovery. The Klondike gold rush, though well-documented, has spurred little critical inquiry, and much of what has been produced remains unpublished. Parks Canada’s numerous contributions, part of its Dawson City reconstruction project, seldom reach beyond narrow, narrative boundaries. Though replete with new information, Hal Guest’s study of Dawson represents, at least for the gold rush period, little more than refined narrative to existing works by Morris Zaslow and Pierre Berton. The principal contribution is that it has pushed chronologically beyond the collapse of the gold rush to examine the early history of the community in decline. Diane Newell has prepared a short study of the image of the Klondike rush, which, while saying little about the goldfields themselves, does explore the evolution of southern perceptions, an important contribution given the power of these attitudes to shape government and business responses to northern development. The work of Thomas Stone stands in stark contrast to the generally descriptive studies of the Klondike gold rush and northern society. In provocative articles on the North-West Mounted Police in the Yukon, Stone has challenged the long-established image of the police as defenders of social order, suggesting that it was the miners who defended it, while the policedescribed as vigilantes  attempted to instill new community values and norms. Drawing heavily on anthropological and sociological theories about authority, social control and community organization, Stone has also examined changing patterns of group relations among the pre-gold rush Yukon mining community and the Herschel Island whalers. Though the theoretical perspectives occasionally overwhelm the historical analyses in Stone’s articles, the studies mark a unique contribution to our understanding of northern society. By examining the internal dynamics of group organization and by then assessing the goals and activities of various agencies of cultural or governmental authority, Stone has done much to chart the evolution of the distinctive northern society created by miners and whalers in the late nineteenth century. The gold rush had its share of noted personalities. One in particular, the colourful Joseph Boyle, gold field entrepreneur, Canadian patriot, and Romanian hero, has been the subject of two biographies. More useful studies include a chapter in David Hall’s biography of Clifford Sifton,  in which the author explores the development of federal policy toward the gold fields, and Lewis Green’s The Gold Hustlers (Anchorage, 1976), a detailed survey of the transformation of the Klondike diggings from individual claims to block land grants held by government supported mining consortiums. Regional historians have also approached government policy in a different fashion by turning the focus away from the southern orientation characteristic of the Zaslow school, or at least balancing their view from the south with a northern perspective. Rene Fumoleau’s passionately argued As Long As This Land Shall Last (Toronto, 1975), provides a useful comparison to Ottawa-based analyses of federal Native policy. Though much of Fumoleau’s evidence is incompletely digested, the book does eloquently reveal the regional response to federal policy directives. Less contentious is “Best Left as Indians,” by K. S. Coates. This essay examines the evolution of government Native policy as applied in the Yukon Territory, and argues that the national directives were never systematically applied in the Yukon. R. Stuart’s “The Underdevelopment of Yukon” is cast much more broadly. In this paper, Stuart suggests that deliberate neglect of regional interests by the federal government allowed the systematic under-development of the Territory. Wealth required for the diversification and sustained economic growth was, with the government’s blessing, quickly drained from the region causing, Stuart argues, an unnecessary post-gold rush depression from which the Territory has yet to recover. By turning the study of federal policy around and examining the regional impact of government programmes, the evolution of national directives in the north, and the northerners’ response to federal initiatives, such studies offer a corrective to the strong Ottawa-centered analysis of this vital theme. 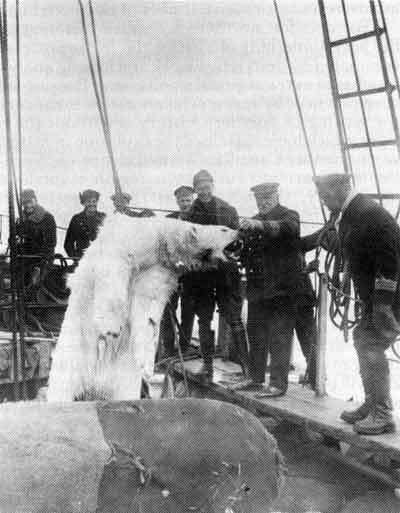 Whalers take a polar bear, c1910. As this list suggests, northern historiography remains a patchwork. The gaps are painfully evident, though to speak positively, the need for extended study of a variety of themes offers exciting opportunities. Perhaps the most visible sign of the limits of historical inquiry is the paucity of its contribution to recent debates. The turmoil of the past decade in the north has provided numerous occasions for such commentary. The Mackenzie Valley and Alaska Highway pipeline inquiries have provided excellent forums for informed and scholarly assessments of the regions’ past and future. Historians, however, have been curiously silent as these discussions have raged, unlike many scholars from other disciplines. The contributions of Gurston Dacks, published as his helpful A Choice of Futures: The Politics of Canada’s North (Agincourt, 1981), M. Asch, Peter Usher and others have helped to focus public attention on northern issues. Historians, with the major exception of Robert Page, have been noticeable primarily by their absence. Page has contributed his historically based analysis of the oil industry (particularly the Norman Wells development) and northern development to a number of conferences and forums. Historians could, as Page has done, do far more by injecting a sense of the past into debates that currently concentrate on the present and future. Northern historiography, like the region itself, remains a field for the future. To date, historians have been concerned primarily with narration and description, painstakingly laying the groundwork for what one hopes will be more interpretive work to come. Until historians of the north begin to address themes of larger national significance or, alternatively, succeed in making regional issues of broader interest, northern history will continue to lack relevance to many contemporary scholars. The emphasis on explorers, adventurers and other colourful characters of the past will, it seems, have to give way at least in part to more analytical approaches to social, economic and cultural questions. Northern historians should also try to balance the continued southern orientation of their inquiries with the view from within the region; the failure to do so will severely limit the utility of their scholarship as regional history. Fortunately, as the growing number of northern specialists broaden their inquiries, they will find a wealth of sources to draw on. The improvement of regional archival facilities at the Yukon Territorial Archives in Whitehorse and the Prince of Wales Northern Heritage Centre in Yellowknife, plus the excellent work (mainly by Terry Cook) on northern collections at the Public Archives of Canada has opened vast amounts of documentary material to researchers. The territorial collections, in particular, contain untapped lodes capable of sustaining far more intensive and innovative studies of northern history. For decades, northern Canadian historiography has been something of a backwater in the profession, dominated by descriptive work and lacking analytical insights of extra-regional significance. Because it has been practiced by so few scholars native to the region, the writing of northern history is without the passions which have sustained the explosion of historical work on other Canadian “limited identities.” Seen for the most part as a curiosity, a region of intellectual marginality, the north’s past has attracted scant attention from serious historians. Little will change until historians of the region adopt the methodologies and interpretive approaches that now dominate their profession and until scholars begin to explore the internal dynamics and character of northern society. If made historiographically relevant, and if placed in a proper regional perspective, northern history will begin to attract a broader audience. Only then can we reasonably expect that Canadian historians will begin to take the north more seriously and, by so doing, find a larger place for the region in the story of their country’s development. 1. W. L. Morton, “The North in Canadian History,” in A. B. McKillop, ed., Contexts of Canada’s Past (Toronto: Carleton University Press, 1980). 2. In this paper we do not consider writing on northern Quebec or writing in the French language. 3. On fur trade historiography generally, see A. J. Ray, “Reflections on Fur Trade Social History and Métis History in Canada,” American Indian Culture and Research Journal, (Summer, 1982). 4. See also A. J. Ray, “Competition and Conservation in the Early Subarctic Fur Trade,” Ethnohistory, 25 (1978), pp. 347-357; Ken Coates, Canada’s Colonies: A History of the Yukon and Northwest Territories (Toronto: James Lorimer & Co., 1985). 5. C. Bishop and A. J. Ray, “Ethnohistoric Research in the Central Subarctic: Some Conceptual and Methodological Problems,” Western Canadian Journal of Anthropology, 6, no. 1 (1970), 116-144. 6. S. Krech III, “The Eastern Kutchin and the Fur Trade, 1800-1869,” Ethnohistory, 23 (1976), 213-235; “Throwing Bad Medicine: Sorcery, Disease and the Fur Trade Among the Kutchin and other Northern Athapaskans,” in S. Krech, ed., Indians, Animals and the Fur Trade. (Athens, Ga.: University of Georgia Press, 1982); “On the Aboriginal Population of the Kutchin,” Arctic Anthropology, 15 (1978), 89-104. 7. The volume, edited by Shepherd Krech III, includes essays by A. J. Ray, C. Bishop, S. Krech, T. Morantz, C. Judd, and R. Jarven and H. J. Brunbach. 8. A. J. Ray, “Periodic Shortages, Native Welfare, and the Hudson’s Bay Company, 1670-1930,” in S. Krech III, ed., The Subarctic Fur Trade: Native Economic and Social Adaptations (Vancouver: University of British Columbia Press, 1984). 9. W. Sloan, “The Native Response to the Extension of the European Traders into the Athabasca and Mackenzie Basin, 1770-1814,” Canadian Historical Review, 60 (1979), 281-299. 10. J. C. Yerbury, “The Nahanny Indians and the Fur Trade, 1800-1840,” Musk-ox, no. 28 (1981), pp. 43-57. 11. K. Coates, “Furs Along the Yukon: Hudson’s Bay Company-Native Trade in the Yukon River Valley, 1840-1893,” B.C. Studies, no. 55 (Autumn 1982). 12. P. Usher, “The Canadian Western Arctic: A Century of Change” Anthropologica, 13 (1971), 169-183; “The Growth and Decay of the Trading and Trapping Frontiers in the Western Canadian Arctic,” Canadian Geographer, 19 (1975), 308-320. 13. Hugh Brody, Maps and Dreams (Vancouver: Douglas and McIntyre Ltd., 1981). See also Brody’s The People’s Land: Eskimos and Whites in the Eastern Arctic (Don Mills, Ont. : Penguin Books, Canada, 1975). 14. M. Asch, “The Economics of Dene Self-Determination,” in D. Turner and G. Smith, eds., Challenging Anthropology: A Critical Approach to Social Anthropology (Toronto: McGraw-Hill Ryerson Ltd., 1979); “The Dene Economy,” in Mel Watkins, ed., Dene Nation  The Colony Within (Toronto: University of Toronto Press, 1977). 15. P. J. Usher, “The North: Metropolitan Frontier, Native Home-land?” in L. D. McCann, ed., Heartland and Hinterland (Scarborough: Prentice-Hall Canada Ltd., 1982). 16. The quarterly “Recent Publications Relating to Canada” included in each issue of the Canadian Historical Review provides a listing of materials on the Yukon and Northwest Territories. 17. A notable attempt to assess northern regionalism is L. E. Hamelin, Canadian Nordicity: It’s Your North Too, trans. W. Barr (Montreal: Harvest House, Ltd., 1978). On regionalism generally, see J. M. S. Careless, “Limited Identities  Ten Years Later,” Manitoba History, no. 1 (1980), pp. 3-9, and William Westfall, “On the Concept of Region in Canadian History and Literature,” Journal of Canadian Studies, 15 (1980), 3-15. 18. Volume two of this study, covering 1914-1967, is due to be published soon. 19. Among the theses written recently on northern topics are the following: George Tripp, “The Stikine Gateway and the Cassiar Region: a study in frontier development,” (M.A., University of Western Ontario, 1975); Dianne Newell MacDougall, “Canada’s share of the Klondyke: the character of gold rush publicity, 1897-1898,” (M.A., Carleton University, 1974); Kenneth Coates, “Furs Along the Yukon: Hudson’s Bay Company-native trade in the Yukon River basin, 1830-1893,” (M.A., University of Manitoba, 1980); Ian K. Kelly, “The Canol Project: defence, politics and oil,” (M.A., Trent University, 1977); Robert Robson, “Flin Flon: a single enterprise community, 1927-46,” (M.A., University of Manitoba, 1980); H. J. Guest, “City of Gold: Dawson, Yukon Territory, 1896-1918,” (PhD, University of Manitoba, 1982); Daniel Grant, “T. D. Pattullo’s northern empire: the Alaska Highway and the proposed annexation of the Yukon Territory, 1933-1941,” (M.A., University of Victoria, 1980); Colin Yerbury, “The social reorganization of the subarctic Athapaskan Indians: an ethnohistorical reconstruction,” (PhD, Simon Fraser University, 1980); Carron Wells, “The development of trade along the northwest coast of Hudson Bay, 1717-1790,” (M.A., University of Manitoba, 1982); Barnett Richling, “Hard times them times: an interpretive ethnohistory of the Inuit and settlers in the Hopedale District of northern Labrador, 1752-1977,” (PhD, McGill University, 1978); Kenneth Coates, “Best left as Indians: Native-white relations in the Yukon Territory, 1850-1950,” (PhD, University of British Columbia, 1984). 20. See for example “The Police and the Native Peoples of the Northern Frontier,” in H. Dempsey, ed., Men in Scarlet (Calgary: Alberta Historical Society, McClelland and Stewart West, 1974) and Showing the Flag: the Mounted Police on Canada’s Northern Frontier, 1895-1925 (Vancouver: University of British Columbia Press, 1985). For an example of the application of Canadian Law, see R. G. Moyles, British Law and Arctic Men (Saskatoon: Western Producer Prairie Books, 1979). 21. R. J. Diubaldo, “The Absurd Little Mouse: When Eskimos Became Indians,” Journal of Canadian Studies, 16 (1982), 34-40. 22. R. J. Diubaldo, “The Canol Project in Canadian-American Relations,” Canadian Historical Association Historical Papers 1977, pp. 178-195; Diubaldo, “The Role of the Arctic Islands in Defence,” in Zaslow, A Century of Canada’s Arctic Islands; Diubaldo and S. J. Scheinberg, A Study of Canadian-American Defence Policy (Ottawa, 1976). 23. S. Grant, “The Northern Nationalists: Crusaders and Supporters of a New North, 1940-1950,” unpublished paper presented to the C.H.A. annual meeting, Ottawa, 1982. 24. P. Kyba, “The ‘Vision’ and the National Development Policy of the Diefenbaker Government,” unpublished paper presented to the C.H.A. annual meeting, Guelph, 1984. 25. See also J. L. Taylor, Canadian Indian Policy During the Inter-War Years, 1918-1939 (Ottawa, 1984). 26. The publications procedures of the Parks Canada Manuscript Record Section are described in C. J. Taylor, “Parks Canada Manuscript Record Series,”Archivaria, no. 12 (Summer 1981), pp. 65-119. 27. G. Bennett, Yukon Transportation: A History. Occasional Papers in Archaeology and History no. 19. (Ottawa: Government of Canada, 1978). H. Guest, “A History of the City of Dawson, Yukon Territory, 1896-1920.” Microfiche Report Series #7. (Ottawa: Government of Canada, 1982). See also K. Coates, The Northern Yukon: A History. MRS #403. (Winnipeg: 1980); R. J. Friesen, The Chilkoot Pass and the Great Gold Rush of 1898. History and Archaeology #48. (Ottawa: Government of Canada, 1981). For a more complete listing, see Parks Canada, 1983 Bibliography: Manuscripts and Publications (Ottawa: Government of Canada, 1983). 28. H. Wallace, “Geographical Explorations to 1880,” in M. Zaslow, ed., A Century of Canada’s Arctic Islands 1880-1980, (Ottawa: Royal Society of Canada, 1980), pp. 15-32, W. R. Morrison, Showing the Flag: The Mounted Police and Canadian Sovereignty in the North, 1894-1925 (Vancouver: UBC Press, 1985). 29. D. Newell, “Images and Image-makers of the Klondike,” unpublished paper, University of British Columbia, 1984. 30. T. Stone, “The Mounties as Vigilantes: Reflections on Community and the Transformation of Law in the Yukon, 1885-1897,” Law and Society Review, 4, no. 1 (1974); Ken Coates, ed. Alaska Highway: Papers of the 40th Anniversary Symposium (Vancouver: UBC Press, 1985). 31. T. Stone, “Atomistic Order and Frontier Violence: Miners and Whalemen in the Nineteenth Century Yukon,” Ethnology, 22 (October 1983), 327-340; Stone, ““Flux and Authority in a Subarctic Society: The Yukon Miners in the Nineteenth Century,” Ethnohistory, 30 (1983), 203-210; Stone, “Whalers and Missionaries at Herschel Island,” Ethnohistory, 28 (1981), 101-124. 32. W. Rodney, Joe Boyle: King of the Klondike (Toronto: McGraw-Hill Ryerson Ltd., 1974); L. Taylor, The Sourdough and the Queen: The Many Lives of Klondike Joe Boyle (Toronto: Methuen Publications, 1984). 33. D. Hall, Clifford Sitton: The Young Napoleon (Vancouver: University of British Columbia Press, 1981). 34. K. Coates, “Best Left as Indians: The Federal Government and the Indians of the Yukon Territory, 1894-1950,” Canadian Journal of Native Studies (forthcoming). 35. R. Stuart, “The Underdevelopment of Yukon,” paper presented to the Canadian Historical Association annual meeting, Montreal, June 1980. 36. F. Peake, “Fur Traders and Missionaries: Some Reflections on the Attitudes of the Hudson’s Bay Company Towards Missionary Work Among the Indians,” Western Canadian Journal of Anthropology, 3, no. 1 (1977), 77-95. 37. A. D. Fisher, “A Colonial Education System: Historical Changes and Schooling in Fort Chipewyan,” Canadian Journal of Anthropology, 1 (Spring 1981), 37-44. 38. K. Coates, “Betwixt and Between: The Anglican Church and the Children of the Carcross (Chooutla) Residential School, 1910-1950,” B.C. Studies (forthcoming). See also R. Jones, “History of the Administration of Schools, N.W.T.,” Musk-ox, 18 (1976), 42-57. 39. K. S. Coates, “A Very Imperfect Means of Education: Indian Day Schools in the Yukon, 1890-1954,” in J. Barman, D. McCaskill and Y. Hebert eds., Indian Education in Canada: Historical and Contemporary Perspectives (Vancouver: University of British Columbia Press, 1985). 40. C. S. MacKinnon, “The Rise and Decline of Agriculture and Horticulture in the Mackenzie District and the Yukon,” Musk-ox, 30 (1982), 48-63. 41. H. Guest, “The Political Apprenticeship of Thomas Dufferine Pattullo,” B.C. Studies, no. 58 (Summer 1983), pp. 55-69. 42. R. Stuart, “Duff Pattullo and the Yukon Schools Question of 1937,” Canadian Historical Review, 64 (1983), 25-44. 43. M. Zaslow, “Administering the Arctic Island, 1880-1940: Policemen, Missionaries, Fur Traders,” W. G. Ross, “Whaling, Inuit and the Arctic Island,” in A Century of Canada’s Arctic Islands. Ross’s contribution can be pursued further in his book Whaling and Eskimos: Hudson Bay 1860-1915 (Ottawa: National Museums of Canada, 1975). 44. Robin Fisher, ““T. D. Pattullo and the British Columbia to Alaska Highway,” M. V. Bezeau, “The Realities of Strategic Planning: The Decision to Build the Alaska Highway,” Curtis Nordman, “The Army of Occupation: Malcom MacDonald and the U.S. Involvement in the Canadian North,” and R. J. Diubaldo, “Canada Asserts Itself in the North,” in K. S. Coates, ed., The Alaska Highway. 45. Richard Stuart, “The Impact of the Alaska Highway on Dawson City,” Julie Cruikshank, “The Gravel Magnet: Some Social Impacts of the Alaska Highway on Yukon Indians;” and K. S. Coates, “The Alaska Highway and the Indians of the Southern Yukon: A Study of Native Adaptation to Northern Development,” in ibid. 46. M. Asch, “Capital and Economic Development: A Critical Appraisal of the Recommendations of the Mackenzie Valley Pipeline Commission,” Culture, vol. 2, no. 3 (1982), 3-9. See also the debate in.Musk-ox, nos. 20-21 (1977-78) between Peter Usher and J. C. Stabler. See also G. J. Dosman, The Arctic in Question (Toronto: Oxford University Press, 1976); M. O’Malley, The Past and Future Laud: An Account of the Berger Inquiry into the Mackenzie Valley Pipeline (Toronto: PMA Books, 1976); G. J. Dosman, The National Interest: the Politics of Northern Development, 1958-1978 (Toronto: McClelland and Stewart Ltd., 1978). 47. R. J. Page, “Norman Wells: The Past and Future Boom,” Journal of Canadian Studies, 16 (1981), 16-33.